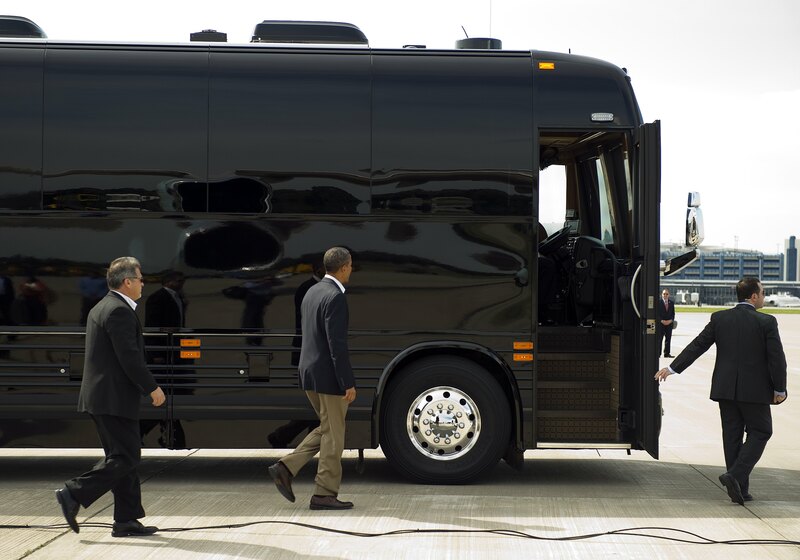 The U.S. Secret Service has two new buses in its fleet for President Obama to use on his three-day, three-state Midwestern bus trip that kicked off Monday. CBS News has learned the buses were purchased in recent months at a cost of just under $1.1-million each and will serve as part of the fleet of vehicles the Service uses for all of its protectees. In the past, the Secret Service would lease buses as needed and outfit them with the security and communications equipment. "We have not been satisfied with the level of protection offered by leased buses," said a Secret Service official. Last year, the Secret Service placed an order for two buses with the Hemphill Brothers Coach Company of Whites Creek, Tennessee at a combined cost of $2,191,960. The buses have lavish interiors and are usually leased to transport stars of the entertainment industry. The company's website says its clients have included Beyonce, Cher, Gloria Estefan, Jennifer Lopez, Stevie Wonder, Lady Gaga, Britney Spears, Mariah Carey, Madonna, Jack Nicholson, and Pope Benedict. Mr. Obama will travel through Minnesota, Iowa and Illinois on the tour. He has four town hall meetings planned, as well as a forum on rural economic issues. Although the bus trip has the feel of a campaign swing, the White House is billing it as "official." That means taxpayers pick up all the related costs. When Mr. Obama ventures out on political trips, his campaign or the Democratic National Committee pay a small portion of the cost of presidential travel, as required by the Federal Elections Commission. But spokesman Jay Carney says "the president is not engaged in a primary election and he is doing what presidents do, which is go out in the country and engage with the American people, have discussions about the economy and other policy issues." Aboard Air Force One en route to the start of the bus trip in St. Paul, Minn., Carney told reporters that "to suggest that any time the president leaves Washington it's a political trip would mean that presidents could never leave unless they were physically campaigning on their own behalf, and he's not; he's out here doing his job and meeting with the American people." But Republican National Committee Chairman Reince Priebus called a news conference in Minnesota this morning to raise objections to the taxpayer-funded nature of the president's trip.